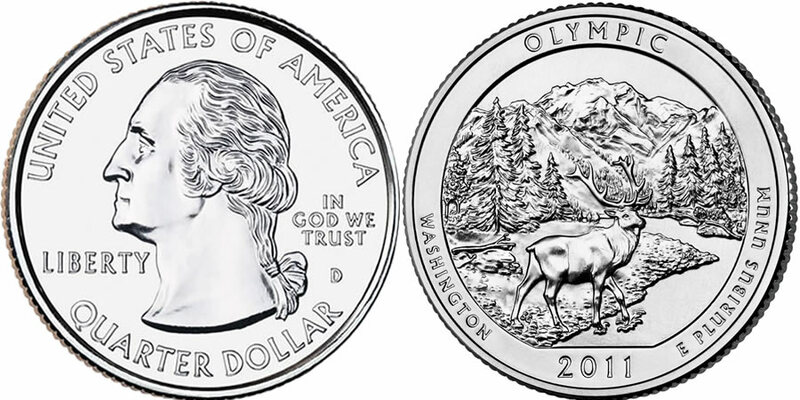 The 2011 Olympic National Park Quarter honors Olympic National Park in the state of Washington. It is scheduled to enter circulation on June 13, 2011 and will also be available from the US Mint in bags and rolls. It is offered as the third 2011-dated strike in the America the Beautiful Quarters® Program which debuted in 2011 and features five strikes annually with reverse designs emblematic of beautiful and historic sites found throughout the Untied States and its territories. In addition to the quarters in circulation, the US Mint also releases the coins in two-roll sets featuring coins from both the Denver Mint and the Philadelphia Mint and 100-coin bags featuring the buyer's choice of which Mint the coins were produced at. Olympic National Park was established on June 29, 1938 by legislation signed into law by President Franklin D. Roosevelt. President Theodore Roosevelt had initiated the protection of the area thirty years earlier in 1909 when he established the Mount Olympus National Monument. A portrait of the first President of the United States, George Washington, is featured on the obverse of all of the America the Beautiful Quarters. It is surrounded by the inscriptions of "UNITED STATES OF AMERICA," "QUARTER DOLLAR," "LIBERTY", "IN GOD WE TRUST" and the mintmark. The portrait was originally designed by John Flanagan and first used on the 1932 circulating quarter dollar. The reverse contains the inscriptions of "OLYMPIC," "WASHINGTON," "2011" and "E PLURIBUS UNUM" and surrounds the image of a Roosevelt Elk as it stands on a gravel bar of the Hoh River with Mount Olympus off in the background. It was designed by AIP Master Designer Susan Gamble and sculpted by United States Mint Sculptor-Engraver Michael Gaudioso.